In 2 States, the story is the weakest link. The film is bolstered by talented actors, gorgeous songs by Shankar-Ehsaan-Loy, nice styling, sumptuous production design and a few sparkling moments. And yet it is a slog. Boy meets girl at IIM-Ahmedabad. Their friendship begins over a rasgulla which gradually turns into love. Magically, '2 States' ends with a beautifully staged wedding where the film's culture-crossed couple finally get their wish. 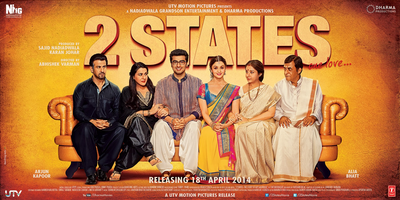 Rare to see a film that supports Indian value systems remains thoughtful, caring and still manages to stay cool..
2 States is a wasted opportunity to encash the popularity of a book. Despite the cast the budgets and brand in place the film fails to make a mark purely due to faulty execution. Not a funny or entertaining rom-com this one. 2 States is the perfect example of how a story in the hands of the right director can be entertaining and can fail miserably if not. The director, Abhishek Varman had a very predictable plot to work with. Perhaps a tad too predictable.